Typically constructed from durable 316 stainless steel - the High Pressure Parallel Reactor is designed as an affordable, compact unit that can be used to screen 10 x 30 ml reactions at pressures of up to 200 bar and temperatures of 320°C. The High Pressure Parallel Reactor can be used with a hotplate stirrer or can be customised to have more rapid heating and/or multiple temperature zones. Users can customise the reactor with options including facilities for internal cell measurement, sealed sample/additions valves, condenser jackets, electrical heating options, liquid charging systems, gas supply/mixing systems, air driven stirrers, purged heating chambers, and many more. It can be built from alternative materials including Hastelloy, Inconel, Titanium and alloy steels, to enable greater heat capacity and use with particularly corrosive or caustic chemicals. Reactors are designed to be extremely easy to set-up (one simple closure), with a fail-safe mechanism to protect the operator. 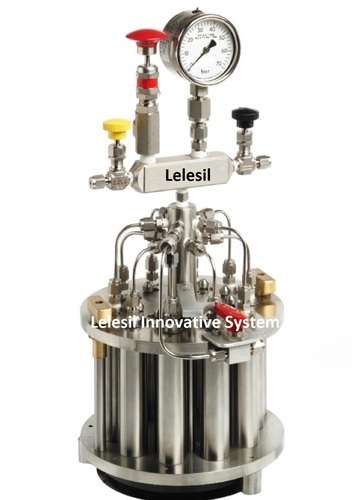 Lelesil Innovative Systems was established in the year 1977 under the leadership of Mr. Anant S. Lele who is a BE engineer from UDCT, the founder & managing director of M/S Silicaware (p) ltd., a Lele group company. The company was started as a manufacturer, Supplier & Exporter of laboratory glassware custom made laboratory apparatus & scientific instruments with an aim of import substitution and suppliers of Borosilicate Glass Wares, Quartz Lab-ware, Vacuum Gauges, Manometer, McLeod Gauge, Dial Gauges, Sight Flow Indicators,Toughened Glasses, Rotary Evaporators. Our products are known for their performance, precision and functionality. These are in sync with the international standards of quality and hence are widely demanded. Our ethical business practice and strong commitment towards customers have made us a preferred choice of the contemporary business arena. We work continually to enhance the quality of our products as per the changing requirements of the industry. We aspire to be one of the most innovative companies at the global level and hence believe in constant up gradation of the technology. They assure whether the products are able to fulfill customization needs of the clients or not. Henceforth, our unmatched products, timely delivery services and cost effectiveness have garnered us a rich clientele.